It all started with Joe and Helen Doll, both are 91 years old and celebrated their 70th Wedding anniversary a few weeks before the sale. Wes Moser, Glenham, S.D. and Pat Thorstensen at the Doll Ranch bull sale. 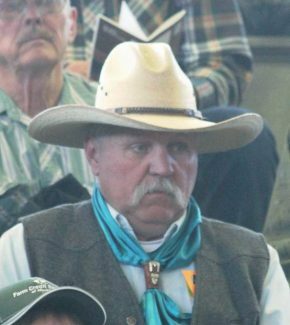 Jim Houck, Akaska, S.D., repeat Doll Ranch bull buyer. 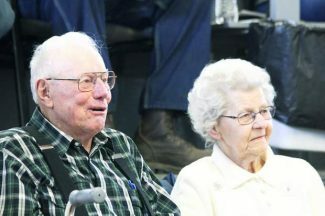 Brothers Charles, Harlan, and David Doll, along with their families hosted the 36th Annual Doll Ranch Charolais and Simmental Production sale at Kist Livestock, Mandan, N.D. This was a set of beef bulls. Thick, deep bodied, long sided and full of red meat. These bulls will sire the calves that will wean off heavy and excel in the feedlot. Both the Charolais and Simmental bulls were eagerly bid on by the large crowd of buyers in the seats for the sale. 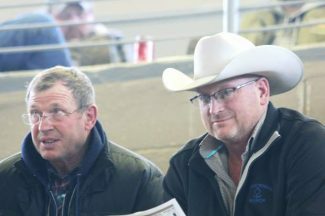 Many in attendance were repeat buyers that know what Doll Ranch bulls will do for their bottom line when they haul heavy feeder cattle to market. Lot 10, DCR Mr. Commissioner C49, a polled purebred son of JWX Silver Buckle 524U born Feb. 2015. This bull had tremendous thickness and depth with weaning ratio of 109 and yearling ratio of 115. This bull ranked in the top 5 percent of the Charolais breed for weaning wt., yearling wt., and scrotal. Wilgenbusch Charolais, Hapoundrite, SK AB was the buyer at $17,000. Selling at $14,500 was lot 54, DCR Mr. Cogburne C228 TW a Mar. 2015, polled purebred son of LT Ledger. Born a twin and still ratioed at 103 for weaning and 110 for yearling, this calving ease bull sold to Darwin Chesroun, Turtle Lake, N.D.
Heitkamp Farms, Wyndmere, N.D., purchased the next two top Charolais bulls. Lot 95, DCR Mr. Complete Solution C392 is a Mar. 2015 son of DCR Mr Solution W13 with an 89 pound birth weight and out of a very productive FC Harvester dam that has weaned 5 calves that ratioed 107. The selling price was $12,500. Selling at $12,000 was lot 25, DCR Mr Cool Duke C113, a Feb. 2015 son of DCR MR 8141 Sir Duke that ratioed 108 for yearling and 121 at weaning. Also selling at $12,000 was lot 4, DCR Mr. Ledger C18 TW to Jerry Wagner, South Heart, N.D. This bull started out a twin at 68 pounds and had a 828 pound weaning wt. and 1,422 pound yearling wt. Lot 110, DCR MR. Chopper C76 is a Feb. 2015 red, purebred son of Erizon Game Face 59Y that has EPDs of CED 6.4 BW 2.9 WW 81 YW 116 MCE 10.3 Milk 21, selling to John Thomas, Velva, N.D. for $8,750. Selling at $8,500 was lot 109, DCR Mr. Cranberry C65, a homozygous polled, red purebred with EPDs of CED 6.8 BW 2.8 WW 78 YW 110 MCE 11.3 Milk 26.4. Heitkamp Farms was the buyer. Rounding out the top Simmental bulls was lot 115, DCR Mr. Cognac C117 another red, polled purebred Feb. 2015 Game Face son. Selling to Bill Kershaw, Menoken, N.D.